3-5 Dashes Berg & Hauck's Aromatic Bitters (Try Orange or Lemon). Place suger cube into a Champagne flute and douse with bitters. Set aside. Add Pear Brandy and Spiced Apple Shrub to a cocktail shaker filled with ice and shake vigorously for 10 seconds. Strain into reserved Champage flute. Top with 2-4 oz Sparkling Wine. Garnish with an orange twist. Add egg white to a cocktail shaker. Vigorously "Dry Shake" the egg white for 30 seconds untill it's good and foamy. Fill shaker with ice, add Pear Brandy, lemon juice, ginger gum syrup, and orange blossom water. Shake vigorously until thouroughly chilled. 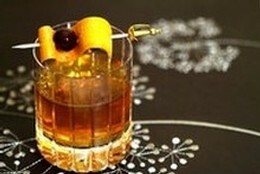 Strain into a chilled cocktil coupe. Carefully place 3-5 evenly spaced 'dots' of bitters on top of the cocktail. Lightly sprinkle with freshly ground nutmeg. Enjoy and repeat (responsibly). Add ingredients to a glass filled with ice, stirr for 30 seconds, strain in to a chilled cocktail coupe. Rub the orange twist around the rim of the glass and set into cocktail. Enjoy and repeat. Cheers!